Problogger revealed his source of income! All blogger know who is problogger (Darren Rowse) one of the most popular blogger around us. Until now he has not yet officially announced his income source properly (I think so), it’s time to see the official announcement of his income source of his blogs. He announced his income source on his blog problogger.net with a video explaining where he is earning money and from which source he is earning good income. All bloggers must see this video who wants to earn money from blogging to get an idea of where we can earn money by blogging. 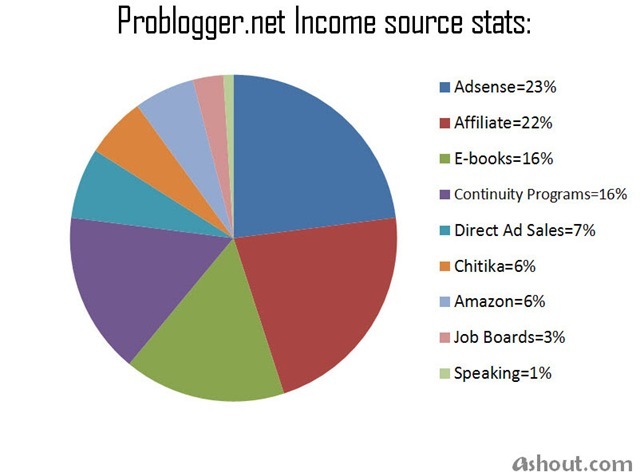 According to his announcement his main income source was “Adsense” what other bloggers earning from blogging. For better understanding purpose we have created a graph see below..
From that graph it is confirmed that he is earning quite good income from adsense program itself, after the adsense his second income is from Affiliate program. If you missed those income source from your blog you try to implement in your blog. Other than these we are able to implement to our blog is only by Direct Ad sales, Chitika and Amazon program in our blog to make some extra money. E-book creating, continuity programs, job boards and speaking is not able to implement to small blogs, it requires you need to be established in that industry and a lot of hard work. what you think about his income source? are you getting the money from the same source itself or from different source? Share with us. Adsense is always a better income source than others.Thanks for sharing. Your welcome dude. I think all blogger depand on only adsense. After sign-up you will see the Available works, select any work which you can able to complete. After completing work ,they will add funds to your account. Yes, Sometime they ask PR. If you don’t have PR simple shift to other work whatever you can able to do that’s it. Adsense has been always a valuable source of income for most of bloggers though i have been paid just once through Adsense 🙁 . You recevied atleast once, but we don’t have adsense account itself 🙁 so, your better than me!